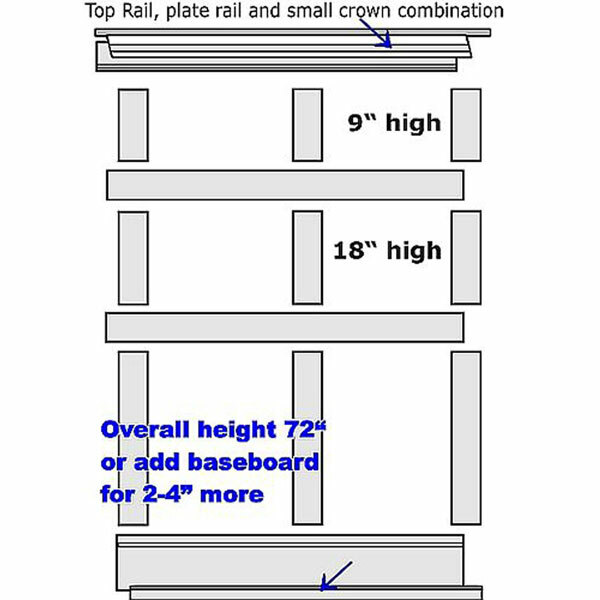 Elite Craftsman FLAT Paneled Wainscot 4ft kit with cornice in paint grade MDF, consisting of several packages-- As illustrated, all in 4 ft, a lower rail, two middle rails, top rail and a small cornice with a plate rail with groves so that the plates wouldn't fall off. Three sets of 3 stiles, 1/2" x 4" wide and 9, 18 and 24" high with the matching flat panels. The panels are the perfect height and over sized at 24" wide. They are made from 1/8" thick primed, MDF board, and can be easily cut on a portable table saw, to suite any layout. This kit is suitable for an overall wainscot height of between 72" and can be made an additional 2-4" higher by adding a baseboard in front of the lower rail.